But that isn’t always necessarily true, and in fact, though they may be few and far between, some really cool video games have been based on movies. We bring you ten of the most awesome games of all times that have been based on an original movie concept. The best part of the GhostBuster Video game was that it featured the likenesses and voices of the original cast of Dan Aykroyd, Harold Ramis, Bill Murray, and Ernie Hudson. This 2009 game comes with a third-person shooter, and the player is equipped with laser beam shooting ‘Proton Packs’ and ghost traps, in place of guns. The game is based in a post-GhostBuster II world, with the team investigating paranormal activities in New York. Entertaining and thrilling in equal measures, this game is loved by the the movie fans as well as gamers. Gamers remember this 1997 game, and its follow-up Reloaded version, as one of the most ultimate multiplayer experiences. Even the single player format was quite impressive. This game, with a first person shooter, was a really neat adaptation of the epic James bond movie of the same name. The sheer quantity and variety of arsenal at the main character’s disposal were formidable, and the stealth mechanism was quite unbelievable for that era. The fact that players, rather than being made to follow a single, linear path, could choose one of the many pathways to a common destination, gave this game a realistic feel and made it an awesome playing experience. If you like blood and gore in more than the recommended dosage, you will love this game based on the X Men Origins. It is implied that the events of the game take place at a time after the movie, but Wolverine is still the rage filled killing machine he ever was. The plot is an intense revenge story, with Logan chasing down the people he believes killed his girlfriend. The injuries are horrifically realistic, with decapitations and mutilations bathing your screen in blood, the enemies are vividly horrifying, and the attacks are spectacular. One of the major reasons the Blade Runner game was so successful was that they had a different plot for the game than what they had for the movie, so the movie could not play spoiler to the game. The game is set in the same grim universe as the movie however, and the player must take up the role of Blade Runner detective Ray McCoy, and hunt down bio-engineered creatures before they wreck the city. This point and click game is considered one of the first real time 3d games, as it was the first adventure game in which the game world progressed in real time, rather than moving with the player’s actions. Again a video game in which the original character, Vin Diesel, lends his likeness, voice, and awesomeness, Escape from Butcher Bay acts as a prequel to the Chronicle of Riddick movie. The game, released in 2004, is set in Butcher Bay, a high protection prison, from which the protagonist, Riddick, must escape. The visuals are still impressive even today, and the game is hair raisingly thrilling, with really cool first person action and stealth element.. The amazing use of light, darkness, and shadows make this an altogether very realistic experience. While this 2002 game does not have incredibly better graphics than other games of its time, it does deserve a mention in any list of great video games based on movies, because of its sheer capacity to recreate the bone chilling universe of the cult science fiction/ horror movie. The player has the first person shooter role of of a soldier who must destroy alien beings who can take over the bodies of any living organism. 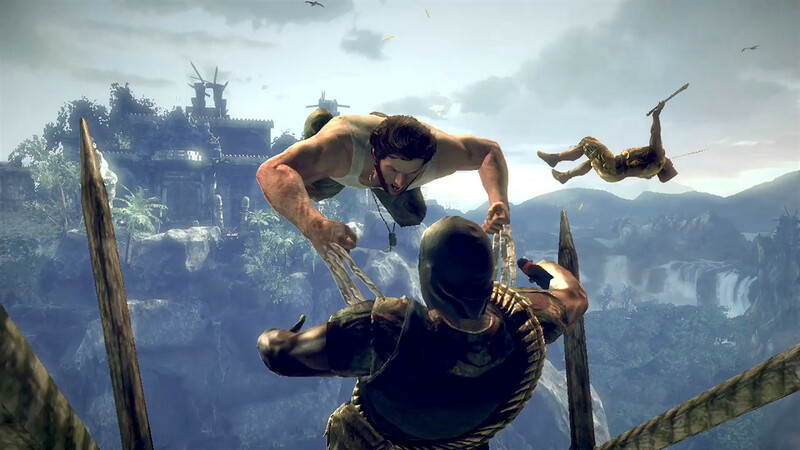 The atmosphere of mistrust plays a large role in the game, as it did in the movie, and the soldier is repeatedly put at risk by his own teammates who have been infected. The horror in the atmosphere is something that gamers will not forget in a hurry. While there have been more games based on Star wars than can be counted, the Super Star Wars series take the cake for being the most action packed and thrilling of them all. This is a simple platform based game, and it has 1992 graphics which really looks silly by today’s standards, but it is reputed to be one of the the toughest games to beat. This game is not exactly a faithful retelling of the original movies, rather, it creates a new storyline with the same characters and the same universe, with far more action and danger stuffed in. It has three levels – Easy, Brave, and Jedi, and Easy is as far as most players get, because this is one brutally hard game to defeat. Tron 2.0 came out in 2003, 21 years after the original movie was released, so today’s generation may not be able to relate to the movie hype much. The main character, Jeth Bradley (son of Alan Bradley of the movie) is played by the player in first person. Bradley is digitalized, that is, he gets converted to a virtual version of himself, and he has to wage war on corrupted computer programs, bots, and hackers who are all try to steal or destroy his company. While the weapons and the enemies are pretty conventional, and you engage in standard gunfights without much else happening, the visuals in this game are something else. The game is brilliantly paced, and the levels are very nicely crafted. This video game, based on the 90s dinosaur movies, captivates players with an action packed game that is just the right blend of fun and thrill. The best part of this game is that, apart from being human hunters, it lets you be the dinosaurs too, in some of the levels. In the nine levels, you are a Compy (one of those little jumping things), and you have to flee the hunters. Then you have to blast through six levels as the human hunter, killing as many giant reptiles as you can with limited ammo. Then you get to be a vicious raptor, and once again you are running for your life, when you aren’t attacking people. Finally, after 20 level, you get to be T. Rex himself, for seven whole levels, and you can lord it out as the king lizard. This game has animation that is nearly as good as the movie, and the soundtrack is very dramatic. The screams of the animals add a whole new dimension to your playing experience.